If you are currently in Phuket and have found that your resort and beach is too busy then this blog is for you. Many tourists arrive in Phuket and think that they can explore the island easily but actually this is not so easy. But never fear, finding a nice quiet beach is easy with this helpful guide. Presuming you are staying in Patong, Karon or Kata, or other nearby resorts these beaches are easy to reach for the day and are still reasonably quiet despite being close to the big resort towns. My top tip is to tell you that there are no private beaches in Thailand. This means you are free to walk through any resort to get to any beach you choose although of course you probably can’t use their facilities while you are there. My second tip; book your road transport from your hotel and avoid tuk tuks whenever possible. When you leave for the day, always arrange your return trip and keep the phone number of your hotel or a trusted taxi driver. Avoid renting your own car or motorbike unless you are very confident with driving on the left side of the road since Phuket is a hotspot for road accidents. 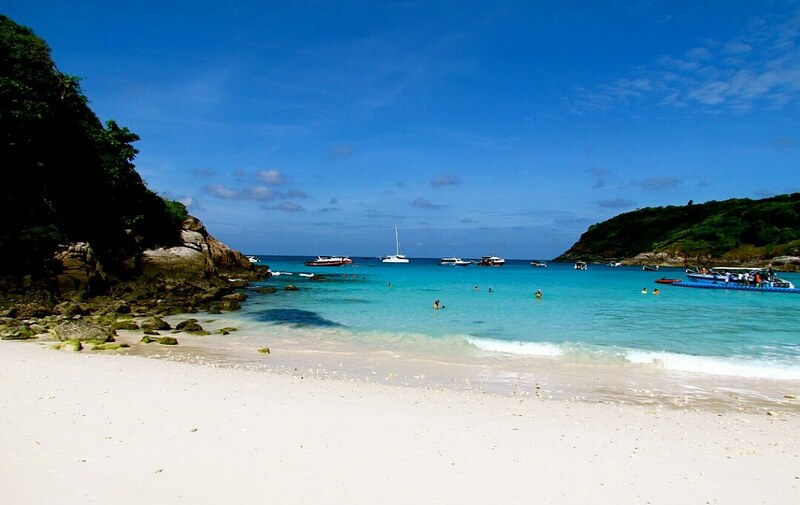 So in no particular order, here are some recommended quiet beaches in Phuket. There is a map of Phuket at the bottom of this blog. About 2km south of Patong on the way to Karon you can find Tri Tra Beach which is an open and sunny beach, perfect for sunbathing. It’s not secluded by any means but it is a huge amount quieter than Patong or Karon. The water is rocky at low tide but there is good snorkelling here. You can get to one of Phuket’s best beaches, Freedom Beach from Tri Tra by longtail boat from here too. Tri Tra beach is reached by going south along the last part of Patong’s Beach Road. and taking a left turn at the Amari Coral Beach Resort then turn down the road that leads to the Tri Trang Resort. Freedom Beach is 2km south of Patong and is a really beautiful beach with white sand, lush vegetation and crystal clear water. It is only accessible by longtail boat during high season, which is from December to May. The shortest route is from the southern end of Patong near the bridge but you can take a boat from Kata or Karon Beach too. From Patong Beach the price is usually 1,000 -1,200 baht per person for a round trip. About 3km south of the main part of Patong, this beach is beautiful and although a little rocky at low tide is fine for swimming all year round. It is also good for snorkelling. The beach is 150 metres long and you can find shade under palm trees. Paradise Beach is located on the same headland as Tri Tra so follow the same directions for finding Tri Tra beach, but drive past the entrance to Tri Trang Resort, pass Merlin Beach Resort and follow the road to Emerald Bay. Keep on going until you reach Paradise car park. Kata Noi is just a few minutes drive south from Kata Beach and you can also walk it in around 15 mintues. Follow the beach road southwards until starts to go uphill. Follow the steeper cliff road up and along for 10 minutes and you will find yourself looking down on a very private and beautiful beach with some very exclusive resorts such as the Kata Thani Resort This beach has everything; it’s close to Kata and Karon, has wonderful white sand, lots of places to eat and is also great for sunbathing and snorkelling. A really lovely place to spend an afternoon. Nai Harn Beach is situated in one of the most beautiful bays in Phuket with the white sand stretching for more than 800 metres. It is on the southernmost tip of Phuket, is where you will find the Phuket Yacht Club, Nai Harn beach is renowned for its spectacular sunsets. It’s not very developed due to the location of a nearby monastery. The beach is ideal for swimming during high season, November to June but is not safe during low season. It has some great places to eat just a short walk from the beach in the little town. To get to Nai Harn drive past Kata beach, up the slope towards the Sunset Bar and follow the road towards Rawai. Once there you will see a road sign for Nai Harn Beach. It is around a 30 minute drive from Kata. Banana Beach is quite far away from the big resort towns but is still on the west coast, which is the same side as Patong and Karon etc. 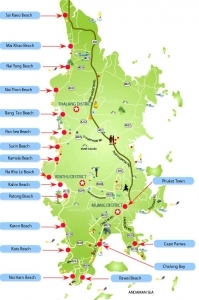 It is situated between Bang Tao and Nai Thon Beaches (see map). This small bay is around 150 metres long and is secluded so not many people visit it each day. It is a small treelined cove with white sands, palm trees and clear waters ideal for swimming and snorkelling. The nearest hotel is the Trisara resort which is 500 metres south of the beach. There is a wooden sign nearby saying “Banana Beach” and you can walk down from there or 150 metres further on there is a sign saying ‘To Nai Thon’ and you can follow the trail down the hill and be led to the beach.You can also hire a boat from a nearby beach to drop you off. Banana Beach is ideal for swimming from November to May but is not safe for swimming the rest of the year. There are 2 small restaurants.